distributed mammal in the land. 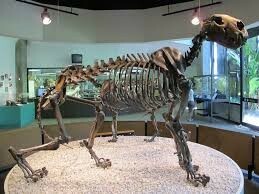 He is the long gone ancestor of modern lions today. Named because he lived in North America and colonized South America. As one of the largest cats and predators, he had no enemies. He was at the top of the food chain and lived for at least 330 thousand years. Sadly he died eleven thousand years ago due to change of climate, which lead to ecosystem disruption. He mostly inhabited in the Americas. He is easily identified by his smoky fur and faded spots on his flank. 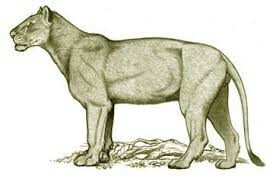 He was also big in structure and looks like a big African Lion. He was very social and traveled in groups of many pairs. But, in many prides there were many solitary lions that would eat last and groom themselves. They would groom each other in social groups and mate for life. For a long time, they did not have manes. They would look almost identical to females other than their size. The females hunted and fed the pride. They act a lot like modern lions today! "American Lion." About.com Dinosaurs. Web. 14 Apr. 2014. <http://dinosaurs.about.com/od/dinosaurpictures/ig/Giant-Mammal-Pictures/American-Lion.htm>. "The Cryptid Zoo: Panthera Atrox." The Cryptid Zoo: Panthera Atrox. Web. 11 Apr. 2014. <http://www.newanimal.org/pantheraatrox.htm>. "Dinosaurs." About.com. Web. 11 Apr. 2014. <http://dinosaurs.about.com/>. "PREHISTORIC CATS AND PREHISTORIC CAT-LIKE CREATURES." 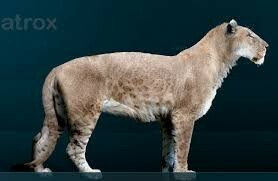 PREHISTORIC CATS AND PREHISTORIC CAT-LIKE CREATURES. Web. 11 Apr. 2014. <http://messybeast.com/cat-prehistory.htm>.